Home | Gallery | AOBW116 | Skin So Smooth, You Won’t Believe It, In 30 Seconds! Skin So Smooth, You Won’t Believe It, In 30 Seconds! The UK is waking up to a New Skincare product. Ginvera Green Tea Skincare has taken the Beauty world by storm. UK beauty bloggers are raving about the amazing results. Fans include Kevin Bennett, Emmy award winning International Makeup artist and Anna Skellern, British Actress of film and TV. Our philosophy is simple; our skincare products do what they say. 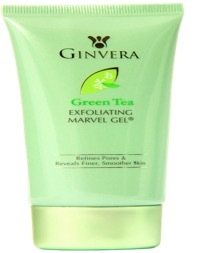 Ginvera’s famous Exfoliating Marvel Gel gives you skin so smooth you won’t believe it’s your own skin! The winter months can be harsh on your skin. Cold weather combined with central heating can dry your skin out. The good news it that you can have fantastic looking skin all through the winter! Simply regularly cleanse, exfoliate and moisturise. Ginvera’s Marvel Gel Exfoliator doesn’t contain any harsh abrasives and is so gentle that you can use it on sensitive skin daily. The series contains Green Tea extract as its main ingredient and is enhanced with soybean extract and herbal ingredients to restore skin’s fairness and clarity the natural way. Green Tea extract is a strong anti-oxidant and helps reduce the damage from the sun’s rays. And best of all Marvel Gel contains NO MICROBEADS. (Those tiny spheres that most exfoliators use and are harmful to the environment). You’ll be hooked and change your skincare regime FOREVER. We don’t say it’s amazing, you do! Marvel Gel fans have called it the ‘Holy Grail’ of Skincare. Go to www.janiro.co.uk to read the reviews and look fantastic, naturally.